BENTON – Charged with wanton endangerment after his six-month old son was found floating in a bathtub, 30 year-old John Mikulich appeared in court today where Marshall County District Court Judge Jack Telle ruled that enough evidence exists to bind the case over to a grand jury. While charges of wanton endangerment were originally filed, the infant child succombed to his injuries on Tuesday afternoon which could change the direction of this case pending autopsy. 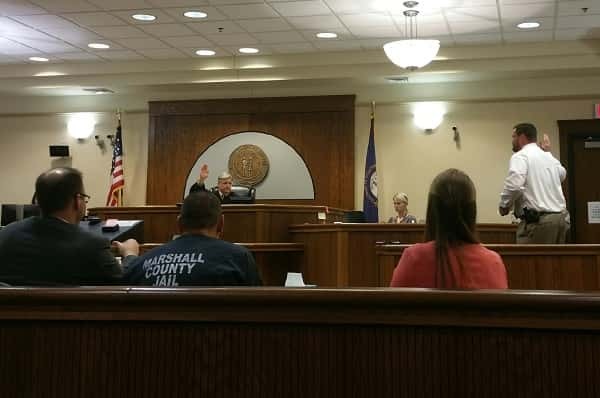 Today however, in a preliminary hearing, lead detective in the case, Marshall County Sheriff Lt. Matt Hilbrect took the stand testifying as to the events that transpired on the evening of March 14th. Hilbrecht stated he was called to respond after initial reports indicated an infant had been found unresponsive in the bathtub of an apartment in Hardin. “By the time I arrived on scene, the baby had already been removed and taken to the hospital,” Hilbrecht said noting there were three other people in the apartment including Mikulich, a second juvenile child who was two years of age and a neighbor identified as Jeremy Littleton. Hilbrecht said Mikulich and Littleton were taken back to the Sheriff’s Office where they were interviewed. “Littleton said he is a friend of the family and said he was back in the bedroom playing Xbox,” Hilbrecht testified. Mikulich had reportedly left the apartment after getting a text message from a neighbor who asked him to come and check out her apartment after hearing a noise. Hilbrecht testified that Littleton said he had cared for the children without incident while Mikulich was gone, approximately 10 minutes. Littleton told police that after Mikulich returned home, he stated that he was going to clean the kitchen and living room because his wife was going to be coming home from work. At that time, Littleton told police Mikulich removed the children from the back bedroom. Littleton stated that he heard water running in the bathtub for quite some time – such a period of time that he became concerned. Hilbrecht said it was at that time Littleton went to check and discovered the two year-old in the hallway pointing in the bathroom where Littleton discovered the infant floating in the bath tub. He reportedly called 9-1-1 and called for the Mikulich. Hilbrecht testified that on the following day, Mikulich requested that a deputy come to the jail where his story changed again. During this interview, he stated that Littleton was responsible. Testimony from today also centered around the defendant’s level of intoxication on the evening of the incident with Hilbrecht describing him as appearing intoxicated saying he was “nodding,” falling asleep” and “dropping his cigarette” while talking with police. The detective testified that Mikulich admitted to smoking marijuana and taking Xanax along with Methodone. Testimony indicated that while blood and urine tests had been completed, they have not yet been returned. Upon execution of a search warrant of the home, wedged between the bed and wall, Hilbrecht testified that officers found marijuana, Xanax and a smoking device. Testimony also indicated that a medical exam at Kosair Children’s Hospital revealed that the infant suffered trauma and had a bi-lateral skull fracture and retinal hemorrhages. Hilbrecht said medical reports indicated the injury was likely from blunt force trauma or being dropped. The infant was on life-support until Tuesday when he succumbed to his injuries. An autopsy is scheduled to be conducted at 7 a.m. Thursday morning. Public Defense Council Jamie Jameson represents the defendant and took the opportunity to clarify a few issues during the hearing today confirming with Hilbrecht that the investigation is ongoing. Hilbrecht confirmed that it is. “At this time, my client is not charged in any way with actually causing harm to the baby is that correct,” Jameson asked Hilbrecht who responded, “at this time, he is charged with wanton endangerment but that may be subject to change.” Additional conversation clarified that at this time, the current charge of wanton endangerment does not infer that the defendant intended to cause harm to the child. Jameson also ensured that Hilbrecht knew the defendant tried to administer CPR to the child which Hilbrecht acknowledged. The defense asked the court to consider reducing Mikulich’s bond to allow him an opportunity to help with funeral arrangements which the prosecution objected to. “This was not an intentional act on his part even if you assume that everything else is true. He [Mikulich] would like to get out and assist with arrangements,” Jameson told the court. Judge Telle said the issue of bond could be reviewed at the next possible hearing date, April 20th, which would follow a decision by the grand jury who will meet on April 16th. Additional charges could follow depending on the outcome of tomorrow’s autopsy.